Convince yourself of PTV Map&Market. The results are realistic, because all conditions and restrictions, such as the workload distribution, personal relationships with customers, visiting hours and where sales staff lives, are accounted for. Thanks to PTV Map&Market's territory and route optimisation, our customers save a lot of time - usually at least half an hour per day and employee. 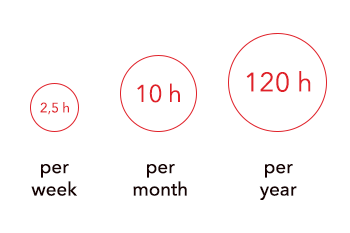 That's 10 hours per month, which they can spend on additional customers visits. Depending on the current sales force structure and size, it is even possible to increase the customer visit rate by 20%. For most of our customers, the software pays for itself within a few months. We will get back to you as soon as possible to discuss the next steps. Provide us with a selection of your data. Of course, we guarantee its confidentiality. A data protection agreement is part of the project. Based on your data, we optimise the division of your territories and customer assignments for up to four connected sales territories. We will provide you with a presentation of the results and your optimisation potential. I would like to receive a free and non-binding tour and area check.